His past medical history is pertinent for a left radical nephrectomy in 2009 for an organ confined renal cell carcinoma. He had a hospitalization in 2012 for acute diverticulitis, which was treated medically. He does not have any cardiac problems. His serum creatinine is 1.8. A CT scan of the chest, abdomen, and pelvis were normal except for the absent left kidney and a five cm mass on the left bladder wall. There were no enlarged lymph nodes. 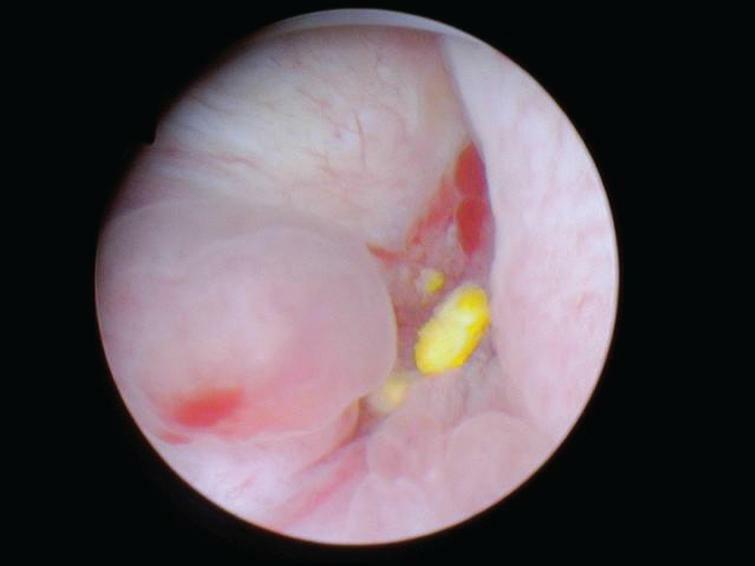 There was no obvious extension of the bladder wall mass beyond the bladder. His physical examination was unremarkable with the exception of his large abdominal girth, the scar from the left nephrectomy, and a moderately enlarged prostate. After medical clearance he underwent a cystoscopy and a transurethral resection of the bladder tumors. 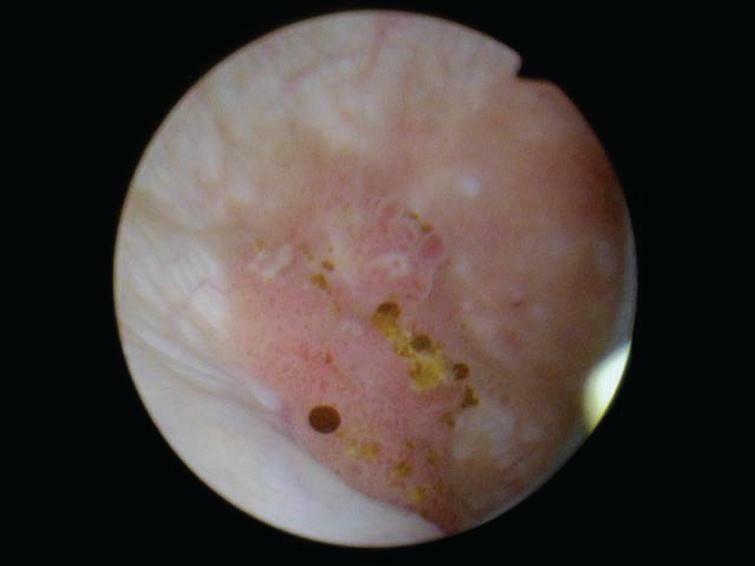 The endoscopy indicated a normal appearing bladder with the exception of a 4– 5 cm sessile mass beginning at the left trigone and extending to the left bladder wall (Figs. 1–3). There was also an adjacent papillary tumor. (Fig. 4). A transurethral resection was performed. 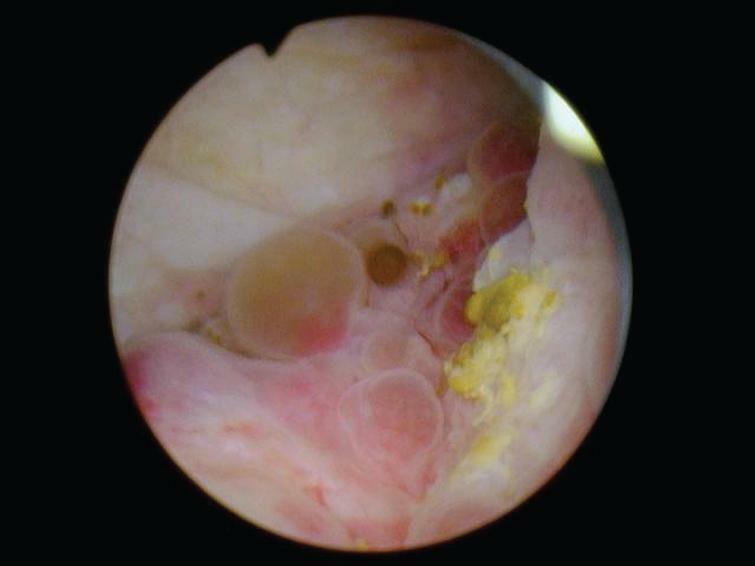 The papillary tumors were easily resected and appeared to be confined to the mucosa, i.e. Ta. The sessile tumor extended well into the muscularis propria and the color of the underlying muscle was altered (Fig. 5). Sessile tumor left trigone/lateral wall. Papillary tumor medial to the sessile tumor. Completion of TUR BT. Note normal appearing muscle to left and remaining dark abnormal muscle to the right. 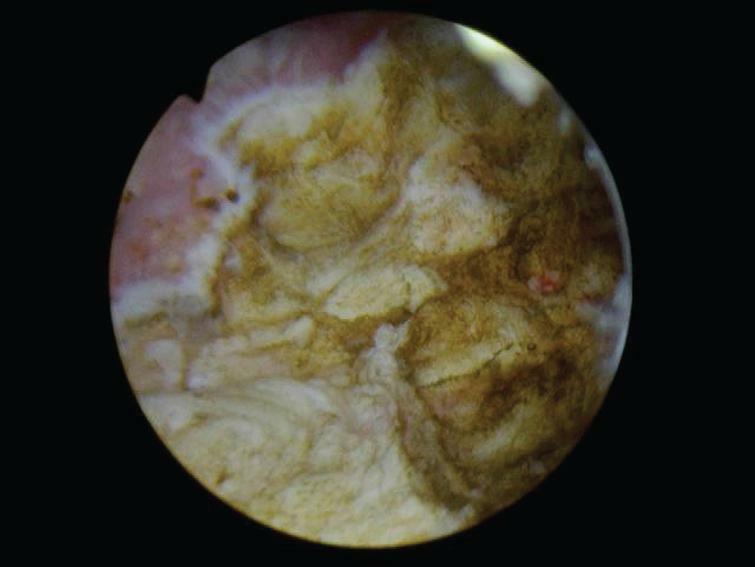 The pathology report showed a high grade muscle invasive urothelial cancer with lymphovascular invasion, pT3, and a papillary low grade (grade 2) tumor confined to the urothelium, pTa. 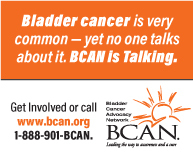 I had a lengthy discussion with the patient and they preferred to consider a bladder preservation approach. He received 4 cycles of gemcitabine and cisplatin. He tolerated this well despite the reduced renal function. A flexible cystoscopy after two cycles revealed no evident tumor and a negative urinary cytology. The patient and family elected to observe and not proceed with radiation therapy. 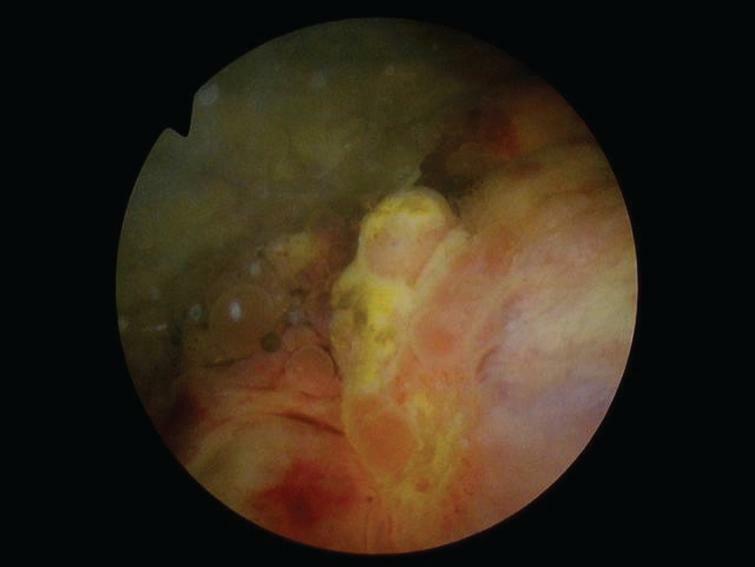 An office cystoscopy in May 2017 indicated a subtle change at the prior tumor location and a TUR bladder tumor was performed (Figs. 6 and 7). 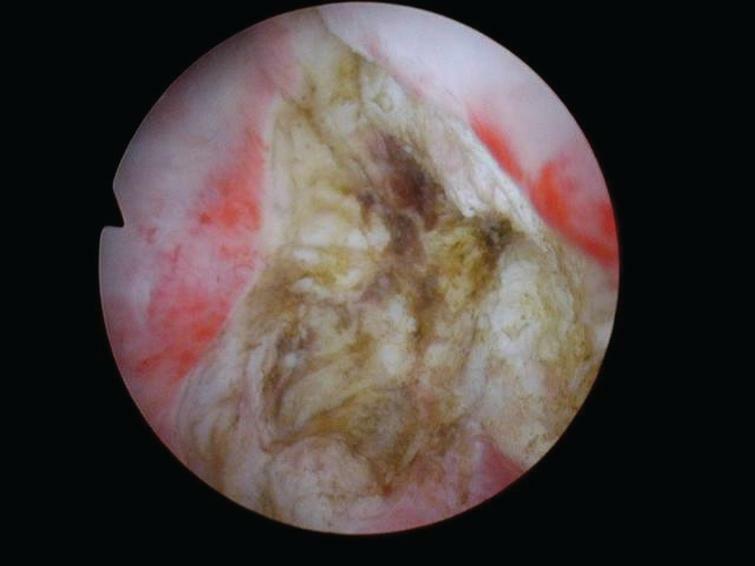 This revealed persistent high grade muscle invasive urothelial cancer. A CT scan identified a 1 cm left pelvic lymph node and was otherwise free of metastasis. The patient now consented to a cystoprostatectomy. Post chemotherapy abnormal area left trigone. Post TUR BT revealing persistent abnormal tissue. The patient has a solitary right kidney, has some reduction in his renal function and is overweight (250 lbs.). The patient now consents to undergo a radical cystoprostatectomy. He has medical clearance. Would you perform an ileal conduit or consider a cutaneous ureterostomy? The advantage of the latter, assuming the ureter appears healthy and will easily reach the abdominal wall, would be a shorter operative time, no need for a bowel anastomosis and thus possible accelerated recovery, and omitting an anastomosis between the ureter and the ileum with a risk of subsequent stricture. The disadvantage might be stricture of the cutaneous ureterostomy site. The final pathology revealed a muscle invasive urothelial cancer with transmural extention to the serosa, pT3b, with two of 14 lymph nodes containing metastatic urothelial cancer. Is there a role for adjuvant therapy?